Our Improvers or Intermediate MTB Skills Courses are designed to build on those skills which you learned during the beginners course. This course is aimed at taking you to the next level of off road riding whether you are moving up from the earlier course or just someone who has been riding for a while but feels that they need a bit of help to step up to the next level. 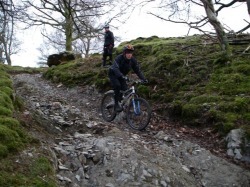 This Improvers MTB skills course is a 1 day course where you will use your now well honed basic skills to help you learn to ride more technical trails. The course lasts approximately 4 hours and is held at the following venues: Belfast, Newry/Carlingford, Newcastle, Omagh. Just go to our Events Calender to check out where our next open Improvers day is and BOOK NOW.